Today is not really a day to write about Lau. I have my sniffles. The temperature is more like Fall than Summer. There is no way that I need a vegetable to cool me down. I am cold already. But this recipe had been cooked and written way back in the heat of summer. With the surfeit of Lau in my blog around that time, I probably gave this a miss.I better post it I thought before the temperature drops further and eating bowlfuls of hot soup in warm jackets make much more sense than eating a lauki. The lauly thoughts that both my daughters are having these days also pushed me to be done with all lau recipes for this year. Couple days back, I was home with LS. The big sis was in school and we were supposed to go and drop off something at her school. LS confidently : Tomake Medium !! I did not dare to ask her to elaborate on this further. It was only a month back that she suggested that I live in a separate house and she would come and visit me only in the evenings. She had tried to assure me that it would be just fine and she would play hide and seek when she came by. You might be wondering about my maternal traits and what I do to that child but trust me I am okay and not really all that bad. Honestly reading a lot of Mom blogs I often have futile hopes that the girls will spout niceties about me which I can put on proud display here. That apparently is not happening. But I will keep at it for looks like there is hope lurking somewhere. Big Sis did have something nice to say about me by the way. For their Back to School night they were to write an autobiography. And on that night, we, the parents, were supposed to read it. Big Sis had "smart, nice and hard working" for her Dad and for me the adjectives were "nice" and "luminous". Now clearly I had expected something more than just plain nice; I love words like fabulous, awesome etc. as adjectives.But it was the luminous that actually threw me off. Me: Why do you think I am luminous ? BS: Errr...because you are bright. Ahem. With the scarcity of compliments around here I will grab anything that comes my way. Now to the Moog Dal Chora diye Lau which is very different from Lau diye Moog Dal. Well in the latter, that is in Lau diye Moog dal, the dal plays the main role and the bottle gourd is just an add on. 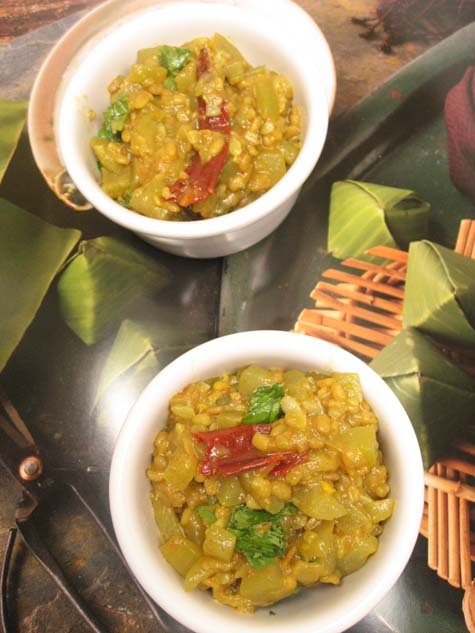 The recipe for that kind of dal is almost similar to the Tetor Dal , yellow moong dal cooked with bitter gourd and lauki, in our home. In the former it is the bottlegourd--the lauki--which makes the dish with the dal complementing it. 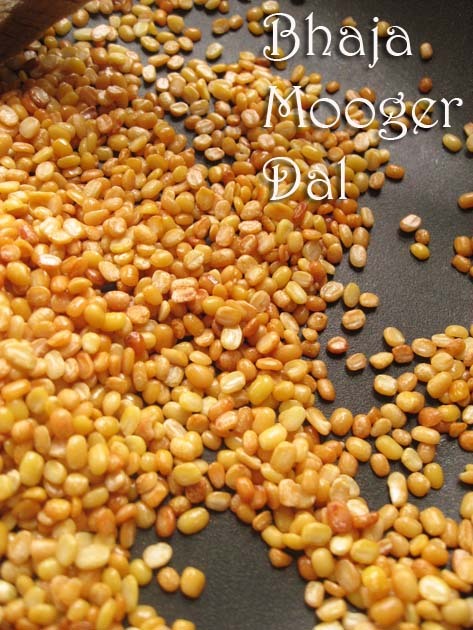 The Moog Dal er Chora means a sprinkle of Moog Dal which accentuates the dish but you can really call it by any other name and increase or decrease the proportion of lentils. Some homes use very little moog dal, literally a sprinkle and cook it along with the gourd while my Mother makes it this way. My Ma makes both of these very often and we like the Moog Dal Chora diye Lau a lot around our home. This post is a first in many respects. First, it is a dish which I have never tasted before. I love Motor Daaler Bora and I have done Borar Jhaal but never have I had a Jhinge Motor Daaler Borar Jhol. Second, this is the first time I have a guest post by a reader on my blog. Usually when a reader sends me a recipe, I try to cook the dish and only then do I post it. Other than that it is only my Mother's and my close friend's recipe(Aditi's Biryani, K's Dal Gosht, T's Tiramisu) which have been posted as is without any intervention from me. So when Soma sent me this recipe last week I was not sure what I should do. I definitely wanted to cook it but with my current schedule, I was sure that a "Jhinge" or "Daaler Bora" wasn't going to happen to me soon. 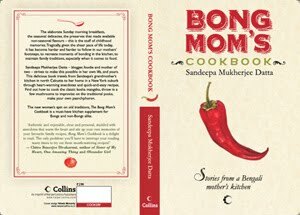 The pictures of the jhol attached to the mail were also fabulous and a whisper in my heart or maybe my ears or somewhere said that many a Bangali Poribar, aka Bong Phamily would benefit much with a recipe like this. So I asked Soma if she could write down the recipe post ready for me and sure she send me a doc with a perfect writeup. So handing over this post to Soma Chowdhury, a reader of this blog, for her and her only Jhinge Motor Daaler Borar Jhol. She sent me this recipe last week and I have posted it in her exact words.. Do welcome her and remember that all the delicious pictures here are Soma's and copyrighted. Last week it was my husband’s birthday and he asked me to make some of his favorites. Jhinge (aka ridge gourd), which was on the list, is unfortunately not one of my most beloved vegetables (although I love most others except this one and kakrol (teasle gourd)). I have tried many times to acquire a taste for these but have failed. As it was, the jhinge-motor daaler borar jhol was on his list and as it was his birthday, I couldn’t refuse. The jhol (gravy with watery consistency) is very light and delicate and mostly eaten at my in-law’s place during summer months to alleviate the scorching Calcutta heat. The jhinge/ridge gourd supposedly has cooling properties and is easily digestible. 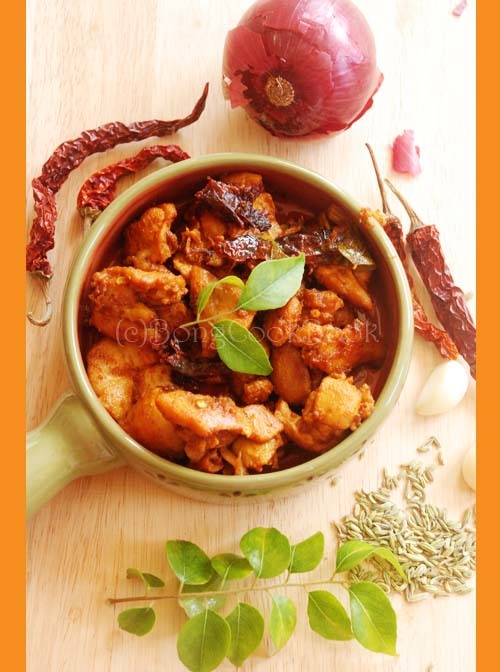 It is hard to tolerate spicy and rich food during summer, so people come up with lighter recipes with fewer spices which are easier on the stomach. When I was in India I never thought that I would grow to love cooking, but I do. As I live far away from home, I miss the comfort food cooked by my mom and my mom-in-law. I try to learn the recipes which are very special to both the families. Whenever we eat something which they used to cook, my husband and I share the memories at our dinner table. Day before yesterday when I served the jhinger jhol, he became nostalgic and said “if I close my eyes now, I can feel the dinner table, the summer heat and all of us eating together”. To me that’s a big achievement. I never thought of sharing this recipe because I do not write a blog. But when I made it, I felt like I should share it with Sandeepa. Being a Bong myself, I like her blog and how she writes about the food, the history behind it, the simple, clean recipes and her sweet sense of humour. I thought she would appreciate such subtle delicacies, and I was right. The moment I emailed her, I got a positive reply. To my surprise, she asked me to write down the recipe with a little story behind it to post it on her blog. I was overjoyed. As I do not follow exact measurement while cooking, I had to think hard to write down the tea spoon and table spoon measurements. I took the picture in a hurry this morning before coming to work. So here is the recipe and hope you all will like it. Three medium sized ridge gourd. Peel and cut into 1/12” pieces (cylinder). Potato two medium sized (optional), cubed. Kalojeere/black cumin seed/kalonji ¼ tsp. Vegetable oil for deep frying the fritters. Soak the washed lentils overnight or minimum 4-6 hours. Grind it to a coarse paste. Add cornstarch, salt to taste and chopped green chilis. Mix well. Heat up the vegetable oil, make small balls (a little smaller than a regular lime) with the lentils and deep fry them. Remove the fried balls or bora and soak the excess oil in a paper towel or any absorbent paper. Heat up the mustard oil. It should be smoking hot. 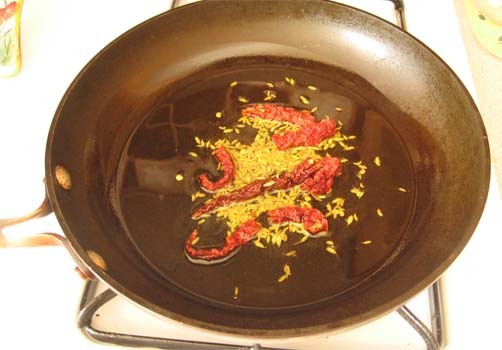 Lower the temperature and then add the kalonji (if the oil is too hot, the kalonji will burn and give a bitter taste). 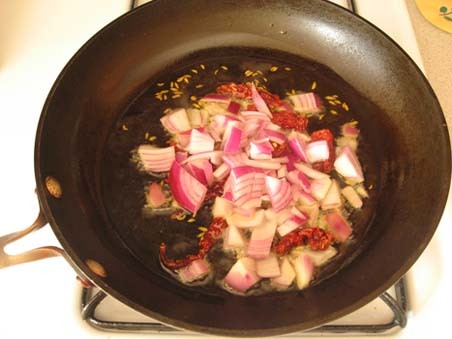 Sauté for few seconds and then add two slit green chilis. Sauté until you can smell the nice aroma of the kalonji and green chilis. Add the potatoes (if you are using them), sauté for few minutes (don’t fry them) and then add the gourd pieces. Add turmeric, sauté for 2-3 mns. more and then add water. Cover the pot and let it boil. Cook it on medium flame for several minutes. Uncover and add three more slit green chilis and salt to taste. Let it boil on medium flame for few more minutes until the vegetables are completely cooked. Check the consistency of the jhol (gravy) and taste for salt. It should be a very thin watery consistency but the raw taste of water should be gone by now. Add the bora/fritters and boil for two more minutes and then turn off the flame. Let it sit for 5-10 minutes and then serve with plain hot rice. 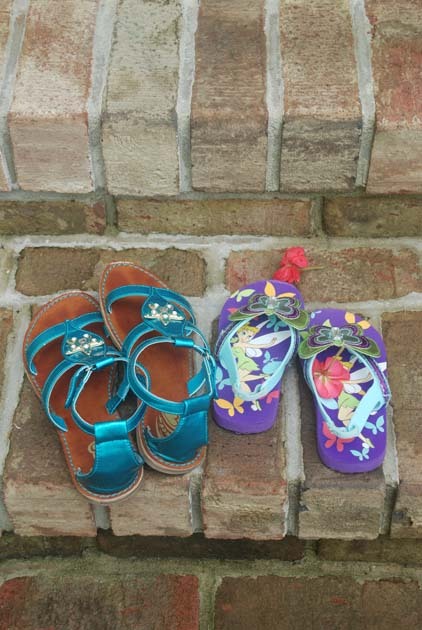 Days of the sandal is now numbered. I feel like grabbing a shoulder, any shoulder and crying but I will not. Instead I will act brave and welcome Fall and think of moving to the Bahamas. Summer is over also means start of school which is not all that bad. BigSis started fourth grade in a new school this year. This new school has a lot of her old friends and so she settled in happily. But in a month she will be moving to another new school. That new school will be a totally *new* school.Yes, we are weird parents taking weirder decisions all the time. All these changes can be real intimidating for a 8 year old but apart from some minor whining she has done good so far. I,myself, have changed schools every 3-4 years as a child and do understand it is not the most exciting thing to look forward to even though it comes with its own advantages. Strangely in spite of my past experience I am more jittery than her about the *new* new school but am trying to act as if it is something one does every other day. "Oh today is a nice sunny Tuesday. Let me go to school# 2 today", seems to be my motto. LittleSis has also moved on to Pre-K and has finally gotten over all kind of school related anxieties. She has finally realized that "School e porashuno hoyna. Shudhu Khela ar khela"(There is no studying in school. Only play and play). Once that realization hit her, she took to school with much more excitement and is kind of okay happy to be there. Fingers Crossed, you never know with that girl. Writing this right now it also hit me how the two girls have grown. Only three years ago I was writing about BS's first grade and a year back it was dealing with LS starting pre-school and now they are in fourth and pre-k and happy to be there. However unlike most sane Mothers I am not at all senti about them growing up. I am happy that BS gets ready for school with almost zero help from me and even LS dresses herself on her own. The only thing I am worried about is I might not have much to blog about once they grow up. I mean it is much more fun writing that LS has changed her future vocation to "Nothing" and that there is a monster living on top of "Beamstalk" than my own PMS. So you see other than blog related stuff I am perfectly happy about my babies getting older. 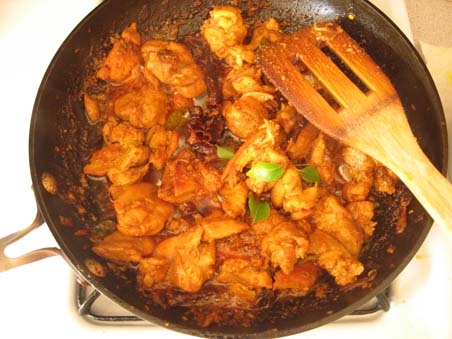 Now on to the recipe which I made specially for BS since she refuses to eat chicken unless it is a spicy, dry dish. We recently had Chicken Varuval at a restuarnt and liked it. No, it had nothing to with Falafel. It was a dry, spicy preparation with South Indian flavors.Incidentally we all love dry, spicy chicken booming with South Indian flavors and so once I realized there was one more chicken fry out there in the world, I had to make it. Of course if it was a difficult thing to do I would have just gone back to the restaurant. 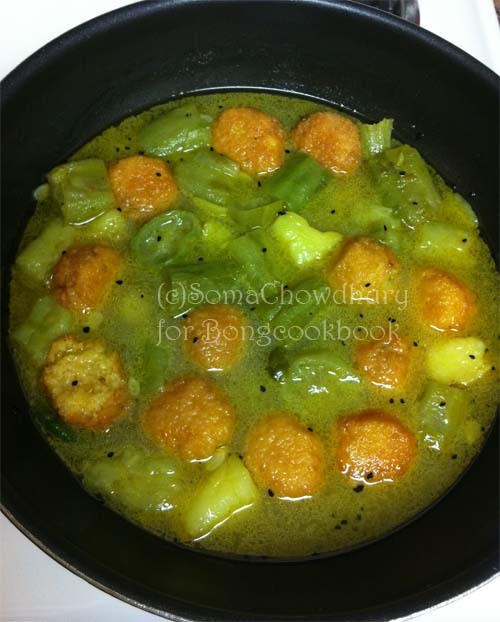 I saw many recipes on the net which I liked but I decided on an unison of this one from Savitha's Kitchen and this one from Sig's Live to Eat. Now both these recipes say Kozhi Varuval which basically means chicken fry but I guess one recipe is from Andhra and the other from Tamil Nadu. I liked the use of fennel seeds in Sig's recipe and I already had the onion paste so there. I also made it less spicy and used only Kasmiri Mirch but BS said she could have handled more heat that that. 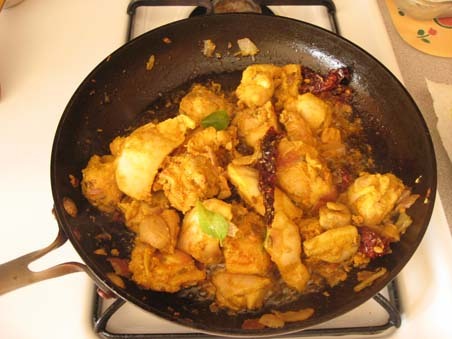 Finally I am making no claims on the authenticity of my dish which is a mix of the two regions but it tasted very good, almost like the one at the restaurant and it was a Chicken Fry-- a varuval. 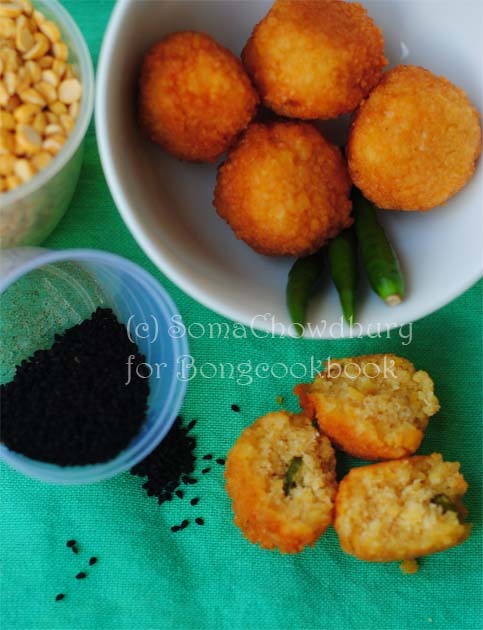 To know more about the original dish also check Srivalli's recipe which I later saw had the cumin-peppercorn powder, a flavor which was present in the varuval I had tasted. Cooking traditional recipes off the net can be tricky as you never know which is which.The problem is triple folds if you are new to the cuisine. Recently at a Food Forum I had an awkward experience where a contributor posted a recipe of prawns with mustard and coconut and labeled it as Prawn Malai Curry. The dish looked perfect and the recipe was great. Only. 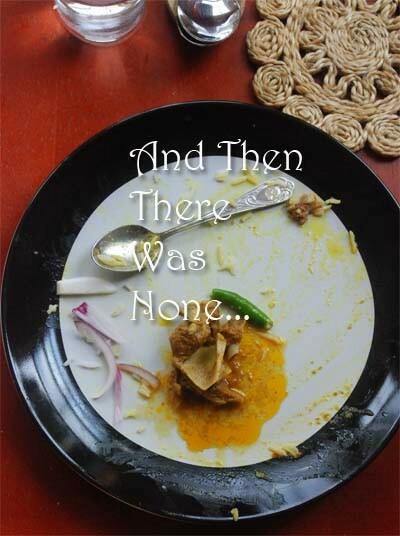 Only it was NOT prawn malai curry. 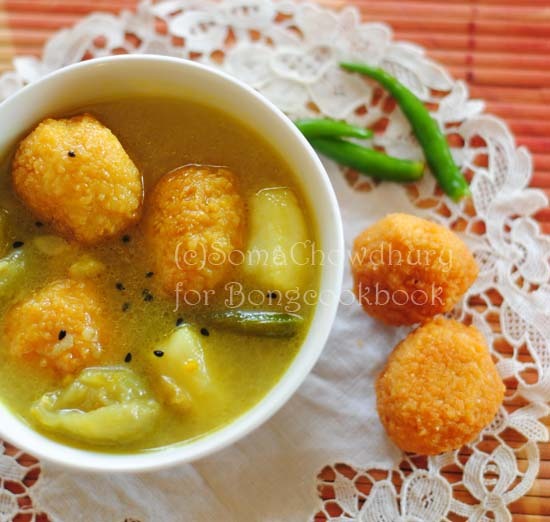 When I voiced my opinion, of course no one liked it and declared that some regions of Bengal cook Malai curry that way. Now honestly I know a lot of Bengalis and not a single person cooks Malai Curry with mustard paste. There are small variations with a ginger here, a garlic not there but definitely NO mustard or poppy seed paste. It would be a situation where one made Alfredo Sauce with tomato base. Now I am not a stickler for authentic recipes and most of my cooking has variations but totally messing up the central ingredient or spicing of a traditional recipe and yet sticking to that name is what makes me queasy. Also I feel when one does their own take on a traditional recipe, it is best to give references to the authentic one and then clearly specify the variations one has made. What do you say ? I used boneless chicken thigh pieces cut in bite size and marinated for almost an hour. Next heat Oil for frying the chicken pieces. half of a small red onion finely chopped. Ideally you should also add few green chilies at this point. 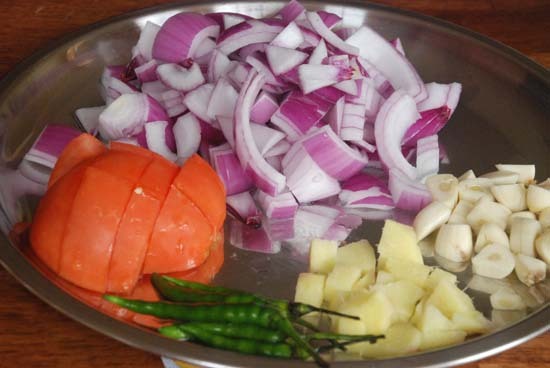 Once the onion is soft and pink add the chicken pieces along with the marinade. Add few curry leaves, around 1 more tsp Kashmiri Mirch and salt. Toss everything together and fry the chicken pieces. The way I do is, I cover the fry pan to let the chicken pieces cook and then I remove cover every few secs and give a good stir. The chicken will release water. Let the water dry up and the chicken get fully cooked. 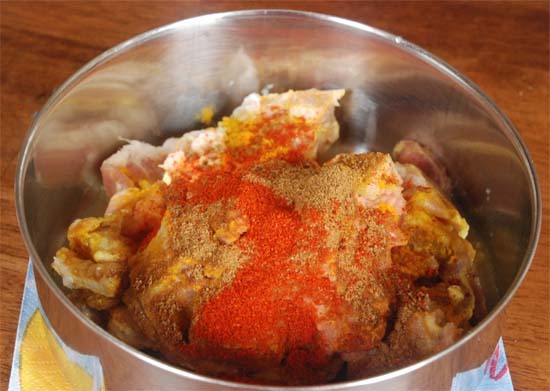 Break up the chicken into smaller pieces if you have not done it before and then fry. You might also need to sprinkle some water in between. Saute till chicken is fried and browned on all sides. 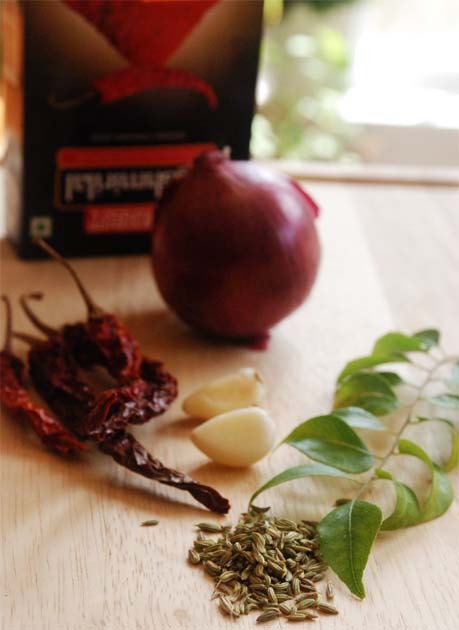 Add more curry leaves and serve hot. I am a big time tea drinker. And I have a special fondness for only my kind of tea. The one with milk and sugar and then brewed with Red Label, with a single tea bag of Earl Grey for flavor. Dipping Marie in my tea and not counting them is another of my guilty pleasures. 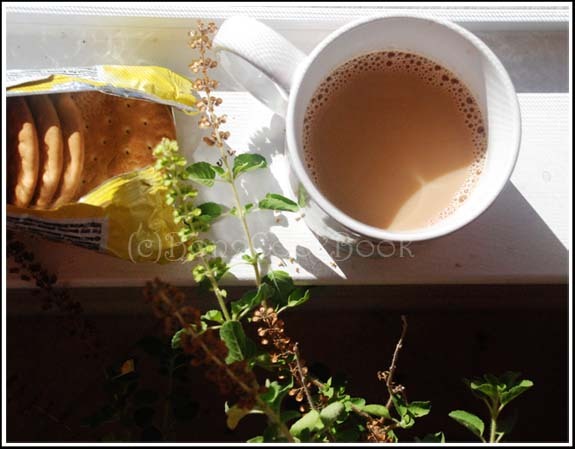 As I was browsing through my tea posts today I came across this post I had written for Of Chalks and Chopsticks -- a food fiction event some of us bloggers had indulged in for a while. If you are looking for great Tuesday reads do go through that list and you may find the perfect thing to pair with your morning chai. 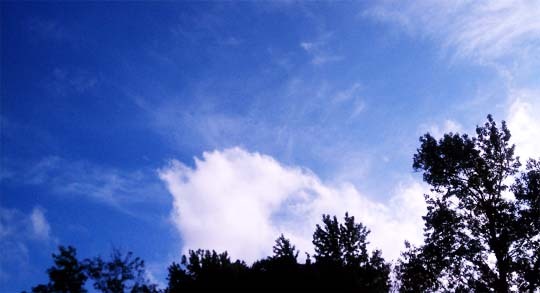 This post is not about clouds. It is about Manghsor Jhol -- Mutton Curry. The Sunday one. The Bengali home staple that has reached a mythical proportion simply by virtue of us bragging about it. And Robibarer Manghsor Jhol does give us bragging rights, the whole gamut of it. 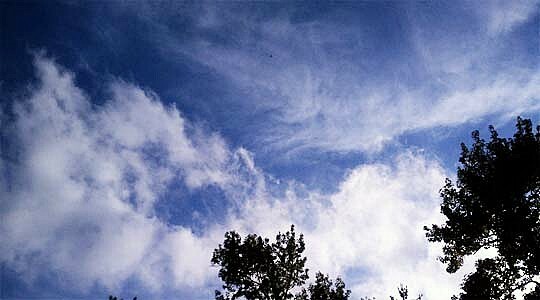 But I have written paeans about it in my earlier posts so today I will talk about clouds instead. Not that I know much about them. The only times I actually watch clouds is when I am stuck in traffic or more specifically when I am stuck in traffic with two kids in the back seat. Also when there is no traffic but a never ending road and two kids in the back seat, I often suggest that they watch clouds. Somehow it makes me feel like a very free spirited kind of Mother, the one who makes blueberry jam and then spreads it thick on coarse rye bread handing them over to her children who play in the meadows by brambles and thistles. Sadly I am not that kind. I have never made blueberry jam and my kids refuse rye bread. And we will not even discuss brambles. But I digress. So anyway this random "cloud watching" thing inspired a desire in Little Sis to spend an entire afternoon watching clouds and nothing but clouds. And she wanted it to be done in a proper setting. Not from cars. Lying down on a sleeping bag(no grass mind you) set out in the deck on some balmy summer afternoon, LS wanted to watch them clouds. Amazingly two summer months almost passed us by and we never got a chance to do that! 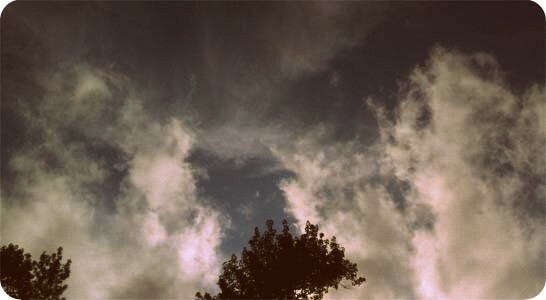 So when summer was drawing to a close, I grabbed a late afternoon with a good measure of clouds and we watched. No proper setting, no sleeping bag, not even grass. While BigSis was attending one of her classes we sat on the ledge by the sidewalk outside her class and watched. "Wow. Doesn't that one look like a teddy bear? ", I said trying to be at my excited best. "No. It looks like a monster", said LS. "Now that one is like a cute little doggy", I said all cloying and sweet. LS who was now more interested in the rocks on the sidewalk than any cloud, glanced and said "Nope. It looks like a big dragon". "Come on. This one surely is like a magic fairy's hair", I blurted out trying to salvage a sweet cloud watch moment. "Oita dushtu lok er moton lagche (That one looks like a mean person)", concluded LS. Okay and before I go onto the mutton curry, I have to tell you this. Soon after turning four, LS seems to have discovered the words "girlish" and "boyish". I have no clue where she got them from but she has been scattering her conversations with those words. Today hearing her Dad's voice over the phone, she declared "Baba sounded very girl-ish on the phone. Maybe he drank too much pink lemonade"
Back to the mutton curry now which is my Ma-in-law's recipe this time. Her Sunday Mutton curry recipe is different from my Mother's Sunday mutton curry recipe and yet they largely taste the same with finer points to be debated on. The mother-in-law's recipe involves marinating the mutton with mustard oil, all the spices, tomato, onion, garlic and ginger that makes the curry. If you can manage to do this single step of detailed marination, the night before, the actual cooking happens very fast the next day. Now on days when you are rushing and a simple mutton curry will do you can side-step the "kashano" or "bhuno" part of this recipe and directly make the jhol in the Pressure cooker. 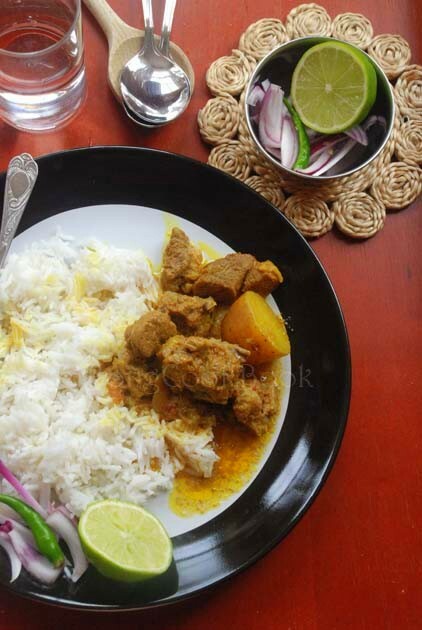 That jhol is a bit runny and akin to something that the famous author Syed Mujtaba Ali would refer to as "Bangali'r Mangshor Maacher Jhol" which means a Mutton Curry which is as runny as plain as an everyday fish curry. If you spend 30 mins of your time in "kashano",then the same mutton curry becomes richer and more regal looking. Take your pick and have a lovely Sunday lunch of Mutton curry and rice. Oh yes, do cook the rice in the same pressure cooker with remnants of the mutton gravy to flavor it and little ghee. My daughters love that rice as much as the curry. Wash and clean 2lb of goat meat. Roughly pound 5-6 hot Indin green chili. Chop 1 medium sized tomato. If the tomatoes are the tough. commercial kind just puree them or get a better tomato. Ideally overnight marination is good but even 3-4 hours works well. Half an hour before cooking toss the pottaoes along with the meat in the marinade. When you are ready to cook, get your pressure cooker. If you don't have one, do not panic, we can also do it in a regular heavy bottomed pan, only it will take longer. Heat about 2tbsp Mustard Oil in the cooker. Add a tsp of sugar and caramelize it. Once the oil is flavored add the marinated mutton and the potatoes. Add the pounded green chilies. Mix everything well together and let it cook for some time. Stir intermittently so that the meat does not stick to the bottom of the cooker. The meat will also release some water. Wait for the water to almost dry up and for the meat to change color. For a richer version of this curry, the meat is kasha-oed for about 25-20 minutes till you see the oil surfacing. But in my Ma-in-law's everyday version, we do not wait for the oil to surface. Once the meat has changed color and no longer looks raw, we give a good stir, and add enough water so that the meat pieces are submerged. Then I adjust for salt and spices and close the Pressure Cooker lid. Once the Cooker starts going "Phissssssshhh", I wait for about 8 minutes or so and then switch off. I have a Futura cooker and it does not whistle so I am not sure of the number of whistles. Once the pressure has been released, open lid and add this fresh garam masala paste(kaaNcha garam mashla bata) along with little ghee. Close the lid again and open only at time of serving. Thanks UshnishDa for this tip.